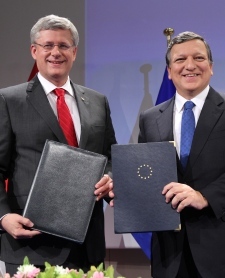 Canada and the European Union reached a tentative free-trade deal on Friday that is intended to eliminate virtually all tariffs and many barriers on trade, investment and labour mobility. 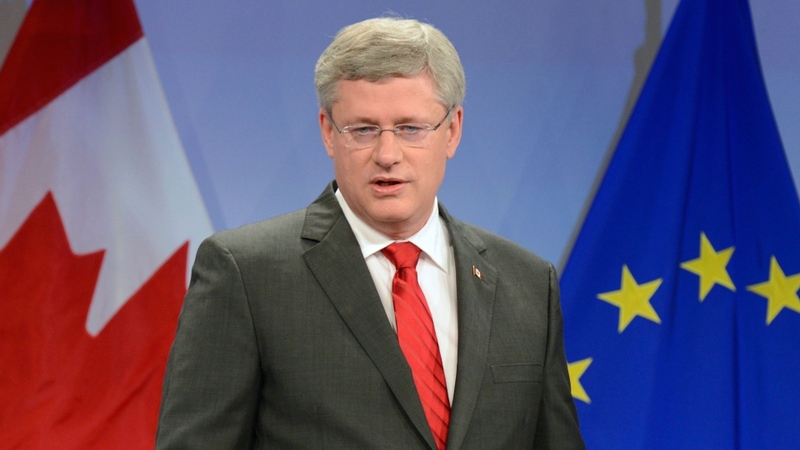 The deal, which Prime Minister Stephen Harper hopes to see fully ratified before the 2015 federal election, would remove 98 per cent of tariffs on imported and exported goods. Harper reached the “agreement in principle” Friday morning in Brussels, alongside European Commission president Jose Manuel Barroso. Canadian manufacturers, entrepreneurs, investors, service providers and professionals will have access to the 500 million people in the EU and an economy approaching $17 trillion. A joint study estimates that the duty-free access of Canada’s seafood, lumber, manufacturing, beef, pork, wheat, and mineral sectors to the EU, will generate around $12 billion in the Canadian economy and create about 80,000 new Canadian jobs. Europe, in exchange, would face eliminated tariffs on exports including: clothing, cheese, wine, dairy products and many others. Europeans will also have access to billions of government procurement dollars at the provincial and municipal levels. 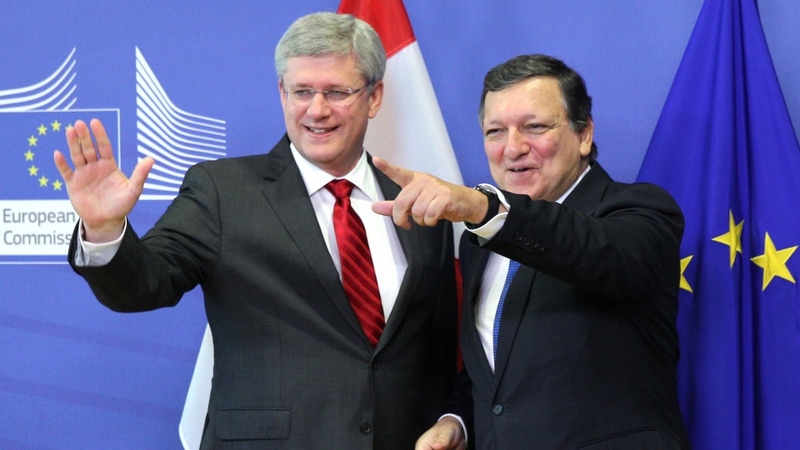 “This is a big deal; this is the biggest deal Canada has ever made. Indeed, it is a historical achievement,” Harper said. But the Comprehensive Economic and Trade Agreement still requires “drafting and fine tuning,” a Canadian official told reporters. Ratification could take another two years and could be complex, requiring all 28 EU members to sign on, in addition with the approval of Canada’s provinces. Ottawa instead released a 44-page overview, but information on what Canada had to cede to Europe is unclear, especially in the dairy and pharmaceutical sectors. Dairy farmers accused the government of a “giveaway” and say they are facing cheaper, subsidized European cheese. But he said that Ottawa would provide compensation to “fully address” negative effects of the deal on the dairy sector. Peter Ruiter, who runs a family dairy farm in Ontario, is worried about the future of his business. Ruiter said he’s most concerned about artisan cheese makers who are facing direct competition from Europe. He says producers in the country are able to produce high-quality products for Canadian consumers. “We can build those products here so why not enjoy it from the farmer that’s your neighbour, and you can trust them,” Ruiter said. The generic drug industry also warned of potential setbacks, saying health-care costs will rise. But Saskatchewan Premier Brad Wall is optimistic about the deal. 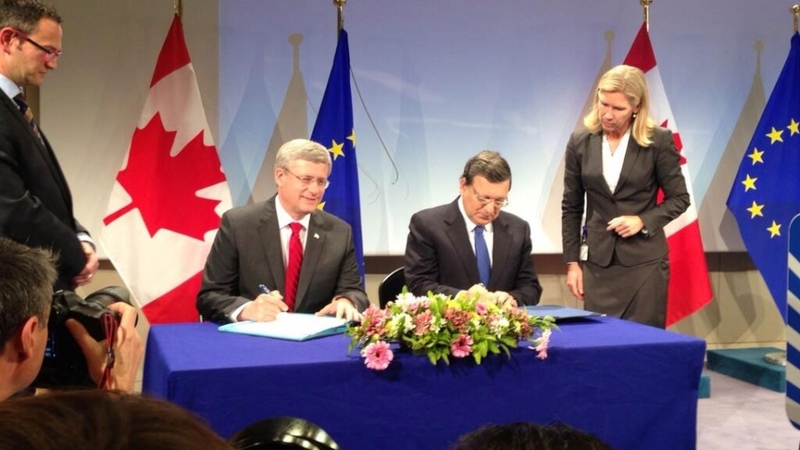 The free trade agreement will allow Saskatchewan beef, bison and grain to gain new access to European markets. The agreement will also ease restrictions on uranium investments from the EU. “There have been up until now, non-resident ownership restrictions on uranium investments in the country, which are principally in Saskatchewan,” Wall said. “So when you consider mining and agriculture -- it’s important for the province, and we see it as a benefit really for the whole country, so we’re very supportive of the deal,” he added. Dave Solverson, vice president of the Canadian Cattlemen’s Association, is also hopeful about the new agreement, and believes that Canadian beef will be in “strong demand” in the EU. Canadian producers will be able to sell an additional 50,000 tonnes of beef. “We’re thinking that it will be a good deal and a substantial benefit to our industry,” Solverson said. But since Europe demands hormone-free products, the way beef produced in Canada could change. “That is why we were adamant that we needed a significant increase in quota -- it has to be commercially viable to attract enough of our industry to shift to the European protocol because it is costlier to produce without growth promotants … but if there’s a premium market for those products, our producers will produce beef for Europe,” Solverson said. “Ideological opposition to free trade in Canada is really today part of a very small part of the political spectrum, a very small and extreme part,” he added. Analysts, however, say the free trade deal with the European Union could affect other trade talks with India, Japan and the Trans-Pacific Partnership.